As a blogger, your social media presence is essential to your success. Twitter is usually a primary choice for most of the bloggers and writers to share their work simply because it’s easy to use and is designed for speedy sharing and consumption. Everyone who is seeking exposure is on Twitter, and that includes bloggers like you and I. The most common way to use Twitter to promote your blog is to post a link to your latest content and hope that you get more visits and retweets from your followers. This strategy is great for attracting new readers to your blog, but sometimes it’s not enough. On average, there are 500 million tweets in a day, so your tweet has to grab a person’s attention just enough so he clicks on the link to your blog post. That’s not an easy feat. To make your tweets stand out, you have to put more effort into what you’re actually tweeting. How to configure Highlight & share WordPress Plugin? However, those who end up reading your blog might want to share your content in a more specific manner. For example, a reader of your blog may want to quote a few words from your content and he wants to share that instead of a link to the entire article. It also works if you want to take a few quotes from your blog posts and share it on Twitter. 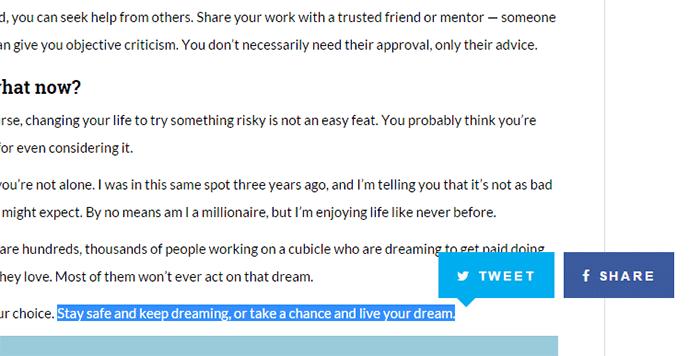 Luckily for WordPress sites, there is a plugin that allows highlighted text to be shared on Twitter. The plugin is called Highlight and Share. Highlight and Share does exactly as it says — anyone viewing your website can highlight any text within your blog posts and share it on Twitter and Facebook. You might be wondering why there is a need to share a quote from a blog post rather than just sharing a link. While regular Twitter updates for new blog posts is a solid way to get more readers, sharing a quote instead of a simple link makes the approach more personal, and gives readers an idea as to what your content is all about. When audiences read a quote instead of a blog title, there is better chance that they will retweet it to their followers, hence more chances for increased blog traffic. After installing the plugin, all you have to do is go to Settings>Highlight and Share and pick from a list of features. 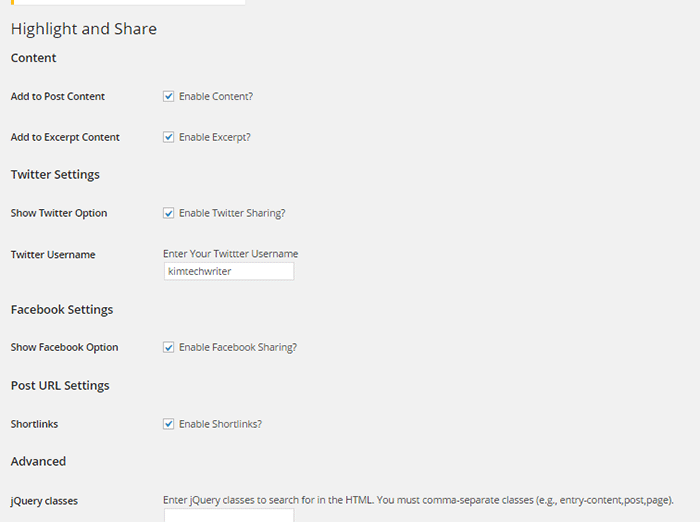 This is where you enable or disable some aspects of sharing. If you only want to use sharing for Twitter, you can uncheck the box for “Enable Facebook”. Type in your Twitter username on the field specified. Do not include the @ sign. Click “Save Changes” when done configuring the settings. Go to your site and check if the plugin works. Highlight any text. You should see two share buttons for Twitter and Facebook if you enabled both. Upon clicking the Tweet button, a pop-up window should appear with the quote and link to the article ready for sharing on Twitter. The highlighted text will not show when clicking the Facebook share button. Sharing on Facebook only posts a link to the article itself. Sharing an excerpt from your blog posts can be a great marketing tool for your blog. You hit two birds with one stone by getting someone to read your article and share it at the same time. Plugins like Highlight and Share make the job so much easier — and it’s straightforward and easy to learn. Have you tried a Twitter sharing plugin that worked wonders for your blog? Tell us in the comments below! Nice highlight technique. Thanks for sharing Kim! great post, a very good plugin for marketing guys. Really the post very helpful since twitter share is a super power for building the blog very popular. Hi Kim, I like this plugin. It also enables me (the blogger) to schedule several Tweets about a post using different text. Good work! Can we share text on whatsapp with this plugin?